Shorter University received a A-. U.S. News & World Report's ranking of 210 out of 236 of National Liberal Arts Colleges High School Counselor Rankings was a major contributor to this grade. 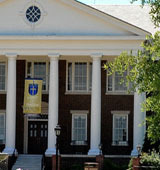 Baptist-affiliated Shorter University, located about 60 miles from Atlanta, offers an education in the liberal arts and sciences, as well a number of pre-professional and career-oriented programs. Shorter boasts a student center, complete with sundeck and indoor pool. What is a typical Shorter University student like? Describe the type of person that should attend Shorter University. What are the top 3 reasons someone should attend Shorter University? What was a typical Shorter University student like in high school? Describe the type of person that should attend Shorter University. A student that prefers smaller campuses, smaller class sizes in order to connect and meet new people. What are the top 3 things that students do for fun at Shorter University? The average student pays $16,612 for tuition, fees, and other expenses, after grants and scholarships. Total stated tuition is $19,300, in-state and on-campus, before financial aid. Learn more about financial aid at http://www.shorter.edu/academics/financial_aid/home.htm. Estimate the net price for you at http://www.shorter.edu/academics/financial_aid/npcalc.htm. Shorter University participates in the NAIA Division I for college athletics. Want more info about Shorter University? Get free advice from education experts and Noodle community members.